Monumental is the story of America's beginnings. Presented, produced, and starring Kirk Cameron, the 90 minute true story follows this father of six across Europe and the U.S. as he seeks to discover America's true "national treasure" – the people, places, and principles that made America the freest, most prosperous & generous nation the world has ever known. Long regarded as "the land of opportunity," there's no question the tiny band of religious outcasts who founded this country hit upon a formula for success that went way beyond what they could have imagined. How else can you explain the fact that they established a nation that has become the best example of civil, economic and religious liberty the world has ever known? What formula did they discover? What motivated them to come here in the first place? More importantly, how can we apply these same foundational truths today? 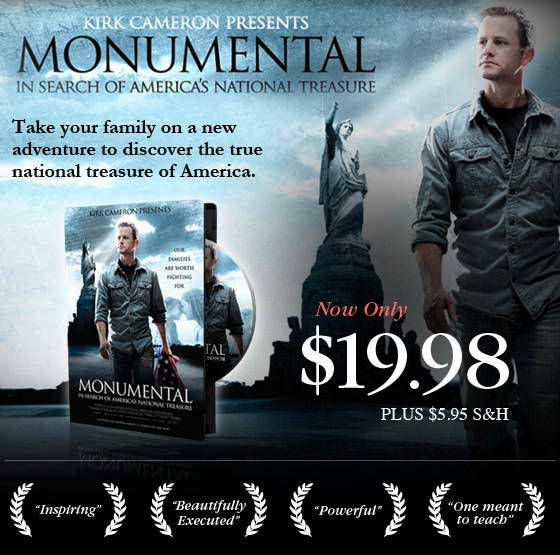 Now available for a limited time, the inspiring and powerful film featuring Kirk Cameron as he seeks to discover America's true National Treasure for only $19.98 + $5.95 P&H.